Since former Federal Reserve head Alan Greenspan’s testimony on October 23, 2008, anti-capitalists of every stripe have seized the opportunity falsely to blame the money and banking crisis upon Ayn Rand’s philosophy and upon capitalism. 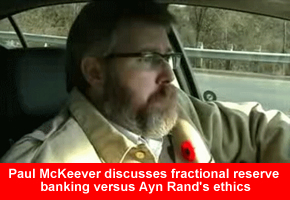 At the same time, some have argued that Objectivism is compatible with fractional reserves in banking. For both reasons, I yesterday turned on the video camera and explained, extemporaneously, the nature of Ayn Rand’s objection to inflation, and why it implies an objection to fractional reserves. DESCRIPTION: A response to those who think the ethics of Ayn Rand’s philosophy, Objectivism, is consistent with fractional reserve banking. In the first part of this video, Paul McKeever gives the general history of how gold came to be money, how banks came into being, how banks started to lend on a fractional reserve, how and why central banks were formed, and how gold was replaced with paper. In the second part, Paul explains the true nature of inflation, and exactly what it was that Ayn Rand found to be ethically wrong about it. You are clearly adamant on this matter. I still think the idea of a fractional reserve in a *private bank* is an excellent assistance to those who seek loans responsibly. So long as the private bank’s reserve is sufficient to cover the normal demands of its clients, then its clients are very well served. If the bank manages its lending wisely, the borrowers do return the value, and it is returned with interest to the original depositor. No wealth is lost, no inflation is occurring. The interest the depositor receives, for the money he allows his bank to use by lending to others, is a free market matter between him and his bank. Similarly the size of the bank’s gold reserves is also a matter of the free market… which requires that its depositors be aware of the size of that reserve. In that case the bank must keep their reserve at a fiscally safe percentage. There is no inflation in that situation either; what there is is an increase in *actual wealth* among the bank’s various clients (particularly among those using the money for a business). That increase in wealth is very reason for the bank to take the risk via the loan, made possible by the bank’s fractional reserve based lending. Since it is the bank that assumes the risks of its loans, the interest rate it gives its depositors will not be high, and certainly will not match the interest the bank attaches to its loans. You would, I think, argue that because more money is in circulation than can be obtained in gold from the reserve that that extra money will have the same inflationary effect as Federally printed money. I disagree. The circulating money returns to the depositors, while increasing the wealth of all touched by its pathway. Money is not a static collection of symbols it is an active tool of value. Fractional reserve lending increases that activity. It speeds up the process of creating wealth. I would much rather make deposits to a private fractional reserve bank, especially if I need a loan one day to expand my business. I still think the idea of a fractional reserve in a *private bank* is an excellent assistance to those who seek loans responsibly….No wealth is lost, no inflation is occurring. It is important to remember that my comments concerning “inflation” relate to the concept of inflation that Ayn Rand was talking about. She, like virtually all economists in the earlier part of the 20th century (and prior), defined “inflation” as: an increase in the number of dollars of which a money supply is comprised. She did not define “inflation” as “as rise in prices”. Lending out the money one has earned or borrowed is great. It is not inflationary: it does not involve increasing the number of dollars of which the circulating money supply is comprised. In contrast, if a bank creates money that it did not earn or borrow, it is, by definition, inflating the money supply. So long as the private bank’s reserve is sufficient to cover the normal demands of its clients, then its clients are very well served. Clients of the bank are not the only ones affected by an increase in the money supply. But, even were they, it would remain the case that – in the long term – nobody is “well served” by the devaluation of the dollar that results from inflating the money supply; nobody is well-served by the theft of the buying power of their dollars. Not depositors, not borrowers, not banks, not people with money tucked away in a sock drawer. If the bank manages its lending wisely, the borrowers do return the value, and it is returned with interest to the original depositor. No wealth is lost, no inflation is occurring. You are mixing two issues. The fact that the borrowers return value has nothing to do with whether the number of dollars comprising the money supply is or is not occuring. The interest the depositor receives, for the money he allows his bank to use by lending to others, is a free market matter between him and his bank. Similarly the size of the bank’s gold reserves is also a matter of the free market… which requires that its depositors be aware of the size of that reserve. Your requirement that depositors be aware of the size of the reserve is, implicitly, a requirement that nobody be defrauded. But the issue of fraud is entirely separate from the issue Rand was talking about: theft, via an increase of the number of dollars comprising the money supply (i.e., via “inflation”, as it used to be defined). In that case the bank must keep their reserve at a fiscally safe percentage. There is no inflation in that situation either; what there is is an increase in *actual wealth* among the bank’s various clients (particularly among those using the money for a business). You seem to be arguing – correct me if I’m wrong – that “there is no inflation because wealth is being created to back all of that credit that the bank is creating”. Such an argument is founded upon the idea that the definition of inflation is: “an increase in prices”. Implicit in such an argument is the idea that, so long as a depositor’s dollar will still buy the same number of peanuts, no theft has occurred. This is a flawed argument because, but for an inflation of the money supply, dollars would have accrued value as the productivity of society increased. When the bank increases the money supply, it seizes that accrual for itself. As an example, if a country’s money supply is comprised of $100, and productivity increases, that same $100 will buy more goods and services. If the money supply is increased sufficiently, that $100 will not buy more goods and services. If the money supply is increased too much (like at present), that $100 will buy fewer goods and services. To appreciate the theft, let’s again consider a money supply comprised of $100 dollars. Jake has $10 in a sock in his drawer: he holds 10% of the money supply. Productivity increases to the extent that $1 can now buy twice the goods and services it used to buy. With his $10, Jake can – after the increase in productivity – buy what $20 would have bought prior to the increase in productivity. Now, imagine that Fred, next door, knows that Jake doesn’t know much about productivity and the quantity theory of money. Fred takes out a printing press and prints up $100 extra dollars that look and function identically to the $100 already in existence. Fred now holds 50% of the money supply and Jake, with his $10 no longer holds 10% of the money supply: instead, he holds only 5% of the money supply. Thanks to Fred having doubled the money supply, Jake’s $10 buys the exact same amount of goods and services after the productivity increase that his $10 would have bought him before the productivity increase. But Fred? Well, Fred – who was penniless before the increase in productivity – can now – after the increase in productivity, and after his creation of $100 – buy what $50 would have bought prior to the increase in productivity. Jake has NO IDEA what has just happened. Fred knows that he has just ripped off everyone – including Jake – by monetizing, and keeping for himself, 100% of the value of the increase in productivity. Now, sure, Fred might lend out his $100 of counterfeit to worthy borrowers, and charge interest; and yes, those borrowers might further increase productivity; but that does not change the fact that Fred ripped off Jake and everyone else in order to be in a position to lend out money. Had Fred not created $100 out of thin air, Jake would have been the person that borrowers went to, looking for money, and Jake, not Fred, would have been paid interest. Fractional reserve lending increases that activity. You are conflating two issues. Lending increases activity, period. Fractional reserves simply make it possible for banks to FORCE value out of the hands of those who earned it, and into the hands of the banks. Put another way: to advocate fractional reserves is to advocate this: “If people aren’t willing to lend out their assets, they should be forced to lend those assets to others, and we can achieve that either by means of taxation or by means of inflating the supply of dollars, so let’s just inflate the supply of dollars and nobody will be the wiser”. The effect – theft – is the same. It speeds up the process of creating wealth. Yes, in the same way that mugging me and lending out the money you stole from me to a productive enterprise speeds up the rate at which those productive enterprises obtain capital and increase productivity. The fact that the process is speeded up by theft does not mean that theft is moral. I’m a bit confused on this issue. I’ve never heard a good explanation of how banks and financial systems work. When I have time I think I’ll watch your video series on the subject and hopefully that will clear things up. Anyway I want to try and clarify something about your position here. Do you hold that the money supply of a country should literally never change? Or that banks should only print more money when it corresponds to real wealth that is produced? If you prefer to just point me to some blog entry or video where you’ve already covered these questions that’d be fine, thanks. Do you hold that the money supply of a country should literally never change? Or that banks should only print more money when it corresponds to real wealth that is produced? If you prefer to just point me to some blog entry or video where you’ve already covered these questions that’d be fine, thanks. Hi Luke. I hold that the money supply of a country should literally never change. To understand my position, it would probably be best to watch my Understanding Money and Banking video series on youtube ( http://ca.youtube.com/view_play_list?p=4EAE930200FB62B6 ). I just have a request. Have you done a video on Monopolies? If not, can you? No, I’ve not done a video on Monopolies per se (although I have done video’s on the Ontario government’s health care monopoly). I’ll give it some thought. Time constraints are tight for me of late.